Until today, you've only been able to view Google Docs spreadsheets on your mobile devices. Last night, we launched new capabilities to Google Docs for your phone that allow you to add new rows, edit existing cells, sort by columns, and filter by terms. 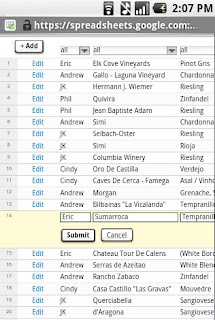 Now you don't have to wait until you get to your computer to update a spreadsheet, whether it's your expense tracker, time sheet, or your wine rating spreadsheet. To check out these new capabilities, just go to m.google.com/docs in your mobile browser and log in. If you are a Google Apps user, go to docs.google.com/a/your-domain. Enhanced mobile access to spreadsheets is available on Android, iPhone (and iPod touch), and Symbian S60. You can read more about these enhancements on the Google Docs blog. Will there be Blackberry access in the future? Yeah, but for whatever reason, when I look at my spreadsheet with finance-related data culled from live numbers, they never update beyond the first row. All I get is "updating" shown in the cells. Yes, why not available on Blackberry? The business crowd is more likely to want to edit a spreadsheet than the iphone crowd. I'm seeing lesser and lesser support for WM from Google whereas the user base of WM is still considerably large. Why do the BlackBerry users, who really need this stuff, always have to wait for the iPhone fashion crowd? Again, no windows mobile support!? The Apple iPhone Safari browser provides no way to lock the browser in portrait or landscape mode. This is particularly annoying when browsing whilst laying down. Apple have indicated that they are not prepared to include this feature on any new version of Safari. Is there any way that Google might consider building an Apple iPhone browser which has this control? When will we be able to edit docs (not just spreadsheets)? Thanx for your good job.I use a G1. Can you please, add an option in Gmail (mobile or G1 ver)to send received attachments (doc, xls etc)to Google Docs of this same account. Another useful option would be "Open as Google Docs". This is good news. Is this Nokia S60 friendly? My N85 is coming soon from Dell, my wife has a N82, and my sister has a N95-3. We all share Google spreadsheets between us and it would be nice to have the ability like this on the go. I also have a Sprint Mogul (Windows Mobile) as my secondary phone that I do more of my document-related typing on (I have a cheap employee plan for that which is why I have a two phone set up for myself). I'm not sure if we can sync documents yet betweeen a windows mobile phone and google, but once we can, I'll put the data plan back on there. Will you please hint me how I can share new idea for new Google Android features, tools and applications. Can I get in touch with their management to negotiate? Is that a jailbroken iPhone in the picture? Google, let's get with the program, shall we? When corporations roll out smartphones to users, it's not an iPhone. It's not on Android, and most likely not on Symbian. It's on Blackberry. I've worked a quite a few global organizations and ALL have used Blackberry's. Why do you always push the Blackberry users to the back? This is the MOST USED business smartphone. Put the "fashion-forward" iPhone folks ahead of the Blackberry is not wise. So tell us: how long do we have to wait for the Blackberry? It would have been quite helpful if Google just provided a obvious "download-this-doc" link for Windows Mobile which already has native spreadsheet editing through Office Mobile. Instead, we get useless single-column displays of multi-column sheets, and no obvious way to transfer native editing back and forth. Even the Webkit based Iris browser for WM is not allowed to perform documentation edits when it scores higher on ACID3 than Safari. Actual Tech-savvy users have switched from their Blackberry devices over to the G1. Everyone keeps complaining that this functionality is more for Iphone users than anyone else, when it is in fact, more for G1 users than anyone else. I for one, am glad that Blackberry users have to wait- because although they are complaining about "fad devices" like the Iphone... they are themselves, using one. The blackberry is nothing but a showpiece for people who want to look important. As an employee of the top enterprise level storage company- I can say with certainty- not every company goes with blackberry, and I rarely see them apart from teenagers and the under 30 crowd. Stop complaining and let the developers do what they have to do to get you this product. Be happy you are even being considered. i have had this idea for quite a while. what if someone wanted a coupon for a certain restaurant. they could text google or some other number and they get a text back of the types of coupons that the company offers. all the person has to do is walk into the store and show their phone to the cashier to get the discount. that's why google stinks... If you get fooled into using google this and google that you end up at their mercy. You'll be forced to use the phone they want you to use, the browser they want you to use, the desktop software they want you to use. Stay away from google's proprietary garbage!! well, when all is said and done. i agree with most here. i wish google would have created a way to edit documents with mobile apps, but they havent yet. knowing google they will do it some day when they get around to it. google is with out a doubt the most advanced company i know of. they have brought internet to a whole new level and have blessed so many with very strong FREE applications and free data storage. they have helped millions of companies grow. they must have the up-most respect. the blackberry is a fashion phone, although i have one myself, and love it. as fare as iphone interfacing, i am sure they do them first because it really is that much easier to code than wm or blackberry os. obviously G1 phone is a google phone, so it would be the easiest for them to code, so it gets first dibs. remember google does not get paid to do stuff like this, its all promotion based. i have been using gmail and many other very strong and useful google tools for a long time. they have been a great service to me and millions of others for free. all my thanks and many blessings Google. ps, keep adding to that google mobile app! looking forward to what google has next for us all!